Carlisle United's players showed a mentality he did not know they possessed in Wednesday's heroic penalty shootout League Cup defeat by Liverpool, says manager Keith Curle. Curle expressed his pride after the Cumbrians held the Premier League side to 1-1 draw after extra-time. 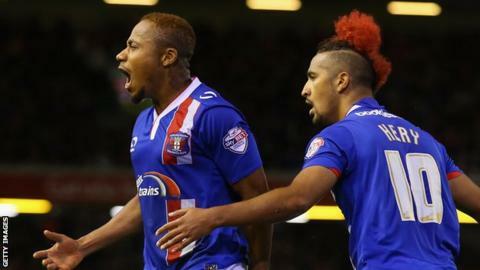 Derek Asamoah equalised for Carlisle, who lost the shootout 3-2. "Mentally I learned something about the players at Anfield," Curle told BBC Radio Cumbria. "We had a feeling Liverpool would play a recognised team, so we made sure the players knew that and not to shy away from it, to embrace it and take it as a sign of respect. "They had to get a yard closer and they didn't shy away. "I'm proud of the players and staff and we've come away from Anfield and made a lot of friends." Since taking over at Brunton Park in September 2014, Curle has overhauled the squad, avoiding relegation last term. Curle reckons that Carlisle, who have lost just once in League Two this season and knocked QPR out of the League Cup, must continue to shown the ambition and desire on display at Anfield. "It's a stepping stone in our progression," Curle added. "We need to be able to go to clubs like this in the future, I want to manage on a weekly basis in the Premier League - we need to be ambitious. "I'm saying to the players everything you do is an expression of your desire to improve. "The thing is I know I've got a squad of players that if I have to freshen it up I can because I've got a lot of quality in that squad."